Too much static you barely can hear anything. Asked for refund but no help. This app is a lie, I feel my daughter move but all I get is static noise and I’m in a very quiet room. So I should be able to hear my babies heart beat especially now that I’m 38 weeks. And nothing. DO NOT WASTE YOUR MONEY ON THIS APP! this app will make a “heartbeat” sound on everyone. The heart beat sound isn’t real, I had my husband & my cousin both tried it and SAME identical sound on both of them and I can assure you no one in this household is pregnant. What a waste of money. Do NOT download it. You will be wasting your time and money. I bought this app at 20 weeks and I’m 35 now. STILL NOTHING. It doesn’t work!!!! Such a waste! I never used this app nor did I approve the purchase of it. I am a nurse and I have daily access to hear my sons heartbeat! I want a refund ! I no longer have the card on file and refuse to update my information knowing that I will be charged for this app. Any suggestions?? I came across this app online and was a bit skeptical. Read a few reviews and decided to give it a try. It was really easy and exciting to be able to hear my baby’s heartbeat in the comfort of my own home!! 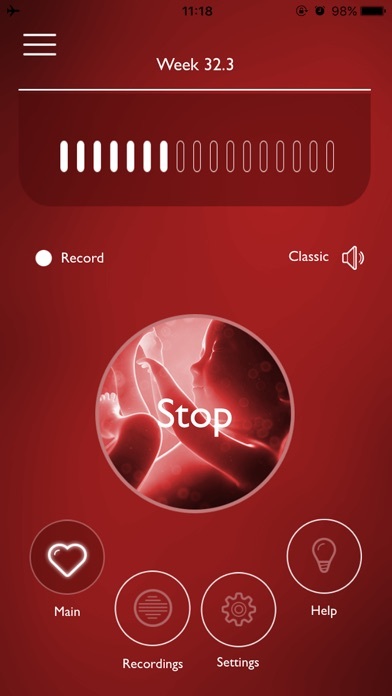 I got this app when I was 15 weeks and now I’m 40 weeks and still can’t hear any heartbeat. It might have worked one time only, but that’s it! Tried a lot of times, a lot of positions and nothing. Waste of money and makes you get worried and think you are the problem. Do not recommend! It does not work! Couldn’t even get a listen to my heartbeat, what a waste of $! Don’t buy this app. It is a complete joke. I wish I would of just paid attention the reviews that advise not to buy it. But of course I wanted to try it for myself. Been having this app since the second trimester and i am now 36 weeks and it still do not work. I’ve tried everything, in a quiet room, took it out the case, and let it sit for minutes. Still nothing but the same staticky sound. Pls save your few dollars not worth it. It’s not easy to tell if you’re listening to a heartbeat or other body movement, or nothing at all. Cannot provide a heart rate. I didn’t find it to be useful and would not recommend. Get a Doppler! I am 38+ weeks and wanted to hear my baby’s heart beat. This app is junk. Followed the directions and recommendations. All I get is white noise. Do not waste the money! This application never works. It was just a waste of money. I delivered a healthy baby on 8/6/18 and was never able to hear her heartbeat with this app. This app is horrible. I tried finding my own heart beat as it was recommended but unfortunately I could Mohr find that either! JUNK! This app does not work. I wish I could get a refund as it never picked up on the baby’s heartbeat like it claims. Scam! I am almost 37 weeks and cannot hear a thing. Worst app don’t waste the time or money. l bought this when l was 13 weeks pregnant, and used lt every week until l finally heard the heartbeat and that was at 38 weeks gestation. So when lt worked lt worked swell but only buy if you’re close to your due date. This app is a waste of money. I’m almost due and the app still doesn’t work. Save your money and use it on something for your baby. I’ve had this app since I was 15 weeks... I’m not almost 37 weeks. It says it works best after 30 weeks but I have never picked up my baby’s heart beat with it. I follow all the instructions. Figure it probably wouldn’t work for the price but still disappointed. Don’t waste your money! 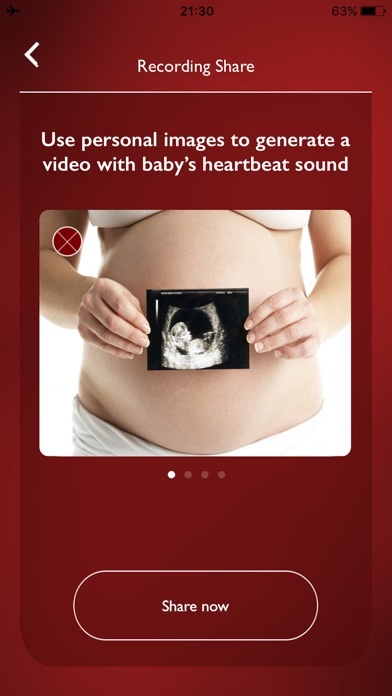 This app doesn’t work for me and I’ve been able to hear my baby’s heartbeat using a heap Doppler since I was 12 weeks. Don’t waste your money or time. I just got it, and really doesnt work. Can’t tell difference in sounds. I would like to request refund and cancelling my app. But no email is provided. Do not! I repeat! Do not! Waste your money on this app!! Piece of crap! Waste of money! I’m 30 weeks and still nothing! Don’t buy this app. It does not work! I’m 34 weeks and I have been trying to hear my baby’s heartbeat since I was 30 weeks. But all I hear is static with no variation. I can’t even hear my own heart beat. I can hear my own heartbeat but can’t hear the babies. This app does not work. I’d like a refund. I payed $5 for this app and I am almost at my due date and it never worked. I tried it every week and looked up how to use it yet it still didn’t work. Out of 5 stars I give it 0. Go buy a Doppler because you can’t hear anything on here resembling a heart beat. Extreme waste of money. I am 36 weeks pregnant and cannot hear anything using this app other than white noise. I got my own heartbeat to work just once, but nothing from the baby, and cannot get my own heart to register a second time. Not worth the money, unfortunately. This absolutely does not work, I have tried for months & it’s nothing but white noise. I am now 30 weeks and still nothing. I honestly don’t know how people are giving good reviews. Waste of my money. Really not happy with the product i couldn’t hear anything and it was so much noise and i was in a very quite room.. i would really like my money back for this app. I’m 38 weeks and I still hear nothing. The sound quality is not good, it sounds like static. The abilities that app has are very basic. It’s really not worth downloading, buying, or wasting the time on it. Don’t waste you money! I couldn’t hear anything but static. I want my money back. This app is horrible! This app didn’t work a single time for me and I have followed all of the instructions and am 35 weeks pregnant. Total waste of money. Didn’t work for me. It supposedly doesn’t work til last few weeks of pregnancy. Invest your money into one that will actually allow it to enjoy your entire pregnancy. Is there anyway to get my money back for this app? It’s been such a waste of time. I’ve had it since 20 weeks but I’m currently 31 weeks & still no luck. Would really love a refund. I can barely hear anything and when I hold phone in the air it sounds the same as when I have it on my belly, even shows accelerations. I’m having twins so I’ve been on monitors at dr office several times in the last month, and it doesn’t sound the same. I bought this app and it’s not downloading to my phone Why?? I recently got bad news about my baby's health at 17 weeks pregnant, so I decided to download this app despite over the bad reviews to keep track of my baby's heart beat but I can't even hear my own heart beat! Such a disappointment. I’m 25+3 today & I try about everyday to get a heartbeat. I know the app says that 30+ is the best time but problem is that the sound is SO low & my heartbeat doesn’t even sound like the examples. Currently hooked to a monitor in the hospital & still can’t use this app. Really disappointed!! I am 31 weeks & 5 days I have not been able to hear my daughters heartbeat. It would make a heartbeat sound no matter what you stuck it too. I want my money back. No idea why it didn’t work for me, but unfortunately, it’s just static. I would strongly recommend not waisting $5 on this app. 😬 I purchased the app much too early on for it to be reliable, but I am now 39 weeks with a very healthy baby, and can not get her heartbeat to come through on this silly static app. I am 35 weeks and have been trying to get my baby heart beat since 30 weeks. Never caught anything. Don’t bother with it. 38 weeks pregnant, doesn’t work. This app is disappointing at best. I got this app at 25 weeks and realized it stated the best results are around 30 weeks. Well now I’m 36 weeks pregnant and still can’t pick up a heartbeat. Even if it could pick up a heartbeat it’d be hard to hear over all the extra white noise. I’ve tried and tried so many time it doesn’t work all you hear is white noise. And I’m doing it right I’m 31 weeks i don’t understand why it wouldn’t work. Don’t waste you money. Wish i could get a refund but they won’t. All I hear is white noise. I’m 39.5 weeks and I can’t hear a thing! I move it around after ten seconds and hear nothing. He’s huge too, and still no heartbeat. The dr office picks it up super quickly but not this app. This was a waste. As soon as I hit the start button it was just making heartbeat sounds and my phone wasn’t anywhere near my abdomen. When I did hold it to my abdomen the sound was the same, the beat was the same. It sounds like a muffled whistle. I really want my $5 back, could have gone towards something so much better. Ridiculous. Not to mention, it seems the developer only replies to the reviews that gave them 5 stars! I’ll admit this was an impulse purchase, but I was still excited to hear my baby’s heartbeat. This is a scam. Anytime the speaker is covered, it starts making a muffled heartbeat sound. Apparently my thigh has a heartbeat, too 🙄...and yes, I know it could pick up my heartbeat too (I’m an RN), but not on the top of my thigh. Don’t waste your money! I bought this really hoping I could hear my baby's heart beat as I'm almost 35 weeks. I can hear my heart beat just fine but spent 20 minutes trying to find his and now I have anxiety over it! He is moving around so I know he's ok but this unfortunately didn't work for me so I do not recommend buying it. You are probably buying it like me to decrease your anxiety but it's only making it worse! This app didn’t work, I bought an actual fetal monitor from Walmart and it worked perfectly! I would like a refund! And I heard nothing. Just static. Don’t buy this. It took me a good 10-15 minutes, but I found my baby’s heartbeat at 11 weeks! Once I found the heartbeat, and got used to how to use the app, it has been a breeze to find baby’s heartbeat. It warms my family’s hearts to hear the heartbeat too and get to be a part of my pregnancy with me. Love, love love! I am now 36 weeks pregnant and I have yet to hear my baby’s heartbeat. This app doesn’t work even at 30 weeks. It’s not worth the $4.99. Does Not Work I’m 31 Weeks And Can’t Hear A Thing. Don’t waist your money. I purchased this app for the same reason as everyone else. I followed instructions, I've tried different locations, I’ve tried it on myself, my stomach, my husband, my pets and my niece and I get no heart beat from anyone. I know it’s only $5 but I want my money back...Very Disapointing. Bought the app at 36 weeks and tried several times to get it to work. Tried all the tricks they suggested and no luck. Better off spending money on another item that will actually do what it says it will and let’s you actually listen to babies heart beat. Don’t waste your money. Worthless app. Absolute waste of money !! I am 33 weeks pregnant and all I hear is pure static!!! Even with my own heartbeat! Complete ripoff!!!!!!! Purchased this app in my second trimester, now 30 weeks pregnant still can’t get a clear heartbeat. Wouldn’t recommend the app unless it was free, but definitely not worth paying for! I’m 31 weeks and was so disappointed that it doesn’t work at all. I followed every prompt and direction and still nothing. Not just no baby heartbeat but clearly I’m a zombie too!! Don’t buy it!! Do not buy, you’re only wasting your money!! Doesn’t sound like heartbeat and my furniture apparently has a heartbeat too. Scam!!! Do not waste your money out of this app. I purchased this app since I was 28 weeks pregnant, and now that I am on my 38th weeks, this app failed to do what it is supposed to do. Yes! I followed all the instruction and yes I was patiently using this app to see its worth. I end up buying a real portable doppler that cost me $27 only on amazon. Even when I know where the position of my baby’s heart, this app couldnt catch her heart beat. So pls, save your money for a real doppler. I am 36 wks pregnant and have tried this for weeks. Still doesn’t work. Don’t bother, don’t waste your money. I can’t imagine these five star reviews are even legit. I knew better but I fell for it anyway. This doesn’t work. Couldn’t even pick up my own heart beat. I wanted to hear my baby’s heart beat and I knew when I bought it it said recommend for 30-40 weeks and so I waited and using it at 33 weeks nothing, I can put it on my husbands skin and it sounds the same, waste of money and Time don’t get fooled! It does pick up heartbeat I’m 24 weeks but the sound is not very well and sounds similar to white noise. I’m in my 38 pregnancy weeks and I can hear the same noise in my belly as in my arm or other part of my body! It doesn’t work! App does not work. Unable to hear the baby’s - if you are considering purchasing to check in on baby, reevaluate your options. It’s worth it to spend more money on a product that works than waste any on this app. It didn’t work for me at all. I’m 32 weeks and I heard nothing. It was a waste of $5. I am 31 weeks and couldn’t hear a thing. Tried it in my own heart and still couldn’t hear a thing. Waste of money. I was looking on buying a doppler until I looked into an app instead. can’t find one that’s accurate or works right. I can hear my heartbeat just fine but I can’t find my baby’s at all. i’ve tried a bunch of times and different places on my belly. nothing. wasted my money just to hear static. We tried so many times, even though you follow instructions, you are in a quiet room, the app gives the same heartbeat to yourself and the baby than to any other object, is a scam, we even tried it in the doctors office dies not work at all. Do not buy it! Doesn’t work. Would like a refund!!! I’ve had this for about six weeks, am currently 34 weeks along, and still nothing. My phone works bc if I put it on my chest I hear my beat (not as loud or clear as you’d expect, though). Tried after leaving drs so I knew exactly where to go and it still didn’t work. Bought app when I was 20 weeks pregnant and have tried it off and on since. Now that I am 34 weeks still not working. I honestly did not think that this would work this early, but I tried it anyway because it’s cheap and let’s face it, I’m impatient. It works! This app does not work what so ever. Do not waste your money. I bought this at 30 weeks, and I’ve tried every week since (I’m now 35 weeks) and all I get is static. I have an anterior placenta which can be why it didn’t work for me, which is the only reason it got 2 stars. I am 10 weeks and still waiting on my first OB appointment. I thought $5 what the heck I’ll give it a shot! It works!!!!!!! I’m so excited but hope I don’t turn into a psycho listening 24/7. I recommend to all mamas! It is definitely worth the money!!! Just take a little time to get the hang of it. You got this!! This app is not working! Will make you only more anxious!!!!! Do not buy this app! How do I get a refund if it doesn’t work? I cannot believe I wasted my money on this. It couldn’t find my heartbeat, let alone the baby’s. The sound did not change ever, whether I was using it or not. I want my $5 back. This app do not work. It sounds the same everywhere you put it. Do not waste your money! Buy a Doppler on amazon. Waste of money and time! This app is not reliable! Do not download it. This app does not work at all!!! It said better results between week 30-40. I am 30 weeks pregnant and it does just make an horrible sound. Money waisted!! Didn’t work with my last pregnancy at all! I downloaded and purchased this app early in my pregnancy and when I open it… it tells me It’s recommended for weeks 30-40. No I’m really far along and I should be expecting a baby within the next month or so and I still can’t get this thing to work. Cannot hear a heartbeat but I can literally see her kicking and I put it right there where she’s kicking at still will not give me the heartbeat. All it gives you is static. Do not recommend!! I Personally Thought That This App Was Gonna Work And Be Able To Listen To My Baby's Heartbeat And I Hear Absolutely Nothing It's My First Baby First Time Mom And Can't Even Hear His HeartBeat! I thought this app would allow me to hear my babies heartbeats....it doesn’t. The app waits till after you purchase it and then tells you it’s recommended for use at 30 to 40 weeks pregnant. This app is a rip off! Total waste of money the sound is terrible just a bunch of static, give me a refund! Don’t waste your money, it doesn’t work at all. Doesn’t work and is a waste of $5. I’m an OBGYN and 30wks pregnant and it’s a waste of time and money. Im 27 weeks now and I’ve had the app sense i was 12 weeks trying it once in a while hoping to hear my baby’s heartbeat, but after finding out my placenta is in-front of my baby i knew it would be very difficult to hear my baby on a app at least i can keep trying hopefully my placenta moves but i really recommend to get your ultrasound done and ask about your placenta before purchasing..
I’m 38 weeks and I’ve never heart a heartbeat with this app. Total waste of money. Have had this app my whole pregnancy and it does not work. Doesn’t work well. All you hear is whistling like noises How can I get my money back!!!!! I downloaded this around my 27 week mark. I am now 39 weeks and 3 days and not only have only been able to find the baby’s heartbeat, but i can’t even find my own. I got the app at 37 1/2 weeks because I thought it was cool. I literally couldn’t find any rhythm, just static... and I tried for a half an hr. Don’t waste your money. Doesn’t work! Would like a refund! Put it on any solid surface and you’ll hear the same sound! This app is a lie! Put it on any solid surface and you’ll hear the same sound! This app is a lie! I put the put on my bed and it was making the same sound as in my belly. Then, I tried with the sofa, the same sound, on my arm, the same sound. This app plays with our feelings! Thanks God I also have a doppler! $5 to the trash! I can’t believe how many good reviews this had. This app is so not worth it. I couldn’t even pick up my own heart beat. The sound quality is awful. I was extremely realistic about the difficulty of hearing my baby’s heartbeat if it was too early. However, after several weeks of trying I think this app is BS. The sound it makes is like a whistling noise and it would take a true medical professional to even hear anything resembling a possible heart beat. Not even close to worth the money. Wish I hadn’t spent it. My $5 could’ve gone toward something much better! Do not waste your money!!! This app is horrible. I’m really disappointed in the quality. I can’t hear anything except for static and I’ve been trying for weeks (I’m 33 weeks pregnant) Total and complete waste of money. I’ve had this app downloaded since I found out I was pregnant. Now my due date is two days away and this app does not work at all anywhere on my belly. This app is deceiving....it’s detects nothing. A waste of 4.99 I tried it on my chest to hear my heart and heard a beat that wasn’t mines, covered the speaker with a pillow and heard a beat, covered the speaker with my hand and heard a beat. Not accurate/precise at all. This app didn't work at all. I couldn't hear my heartbeat let alone the baby's. I bought this app to give it a try. I am 36 weeks and 5 days. Baby is head down and obviously isn't moving all over. Just left the doctor and used this right where doctor found the heartbeat-I get nothing. I could barely pick up my own heartbeat! I followed all the instructions (airplane mode, listened to samples, etc). What a disappointment for $4.99!!!!! Ugh! I hate it ... this app does not work. I’m at 28 weeks, and I was able to listen to my baby’s heart beat! You just need to follow the instructions (there’s a video). I also recommend you to listen to the sample sounds, just so that you would have an idea of what you are looking for. It doesn’t sound like the Doppler or your doctor’s fancy ultrasound, but you can definitely hear your baby’s heart ❤️. I love it!! I am 33w2d and I don’t here anything. Ive tried everything, and still nothing. I wouldn’t recommend this app to any of my pregnant friends. Very easy to find the heart beat. I was able too use it really early in my pregnancy. Horrible quality and sound! Not worth paying for; should be a free app. This app does not do anything! It is a waste of money. My wife is 40 weeks pregnant and I still can not hear my baby’s heartbeat! I could I would give a minus star -5⭐️ rate! With others apps I can hear baby's heartbeat, but in this I can't! Don’t waste your money just go out and get you a fetal heart Doppler!!! Wish I could get my Money back!!! 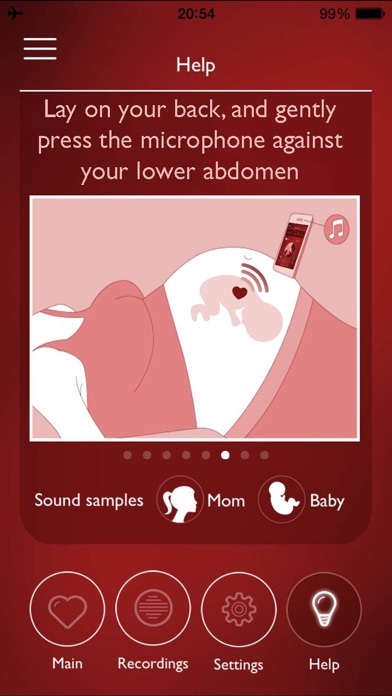 This app does not work I'm 35 weeks can't hear the baby heart beat. I bought this app at 14 weeks (I know it says to wait until 30 weeks but I was so excited). I tried every week to see if I could hear anything from baby and not once did his heartbeat (I went to 41 weeks). Totally a waste of money. It’s too much static I can’t even hear my heart beat I don’t like it and I want my money back. I am now 38 weeks pregnant and it doesn’t work. My doctor finds the heartbeat in seconds and I put it on/around the same area and it doesn’t work. Not worth the $5.00. Took a while but heard that heartbeat loud and strong at 25 weeks! Would be nice if the app had a stopwatch to calculate the heart rate. Don’t waste your money, and time. It doesn’t work at all, it sounds like a tv with bad reception, it makes the same sound in your leg, arm and my husbands belly... it’s crap. I downloaded and payed for this app at 25 wks pregnant and tried to use all throughout my pregnancy and never got to hear a heartbeat. Very disappointed. I downloaded the app because I was curious. I got kind of excited when I put the phone on my belly and it was picking up a quick heartbeat. My husband put it against his stomach right after me and it sounded the same, just not as strong. 😂 Its a cute app and it’s nice if you always worry and want reassurance, but I don’t think it’s very accurate. App does not work how do i get my money back..
From the moment I found out I was pregnant I've wanted to listen to my baby's heartbeat. My husband talked me out of buying a Doppler because he said I would freak out if I couldn't find the heartbeat. I downloaded this app today hesitant to whether it would work and it took some patience but I found it in about 10 minutes. I may not always be that lucky but I like this app so far! I'm 19 weeks along. 5 dollars well spent even if it's the only time I get to hear it from home. 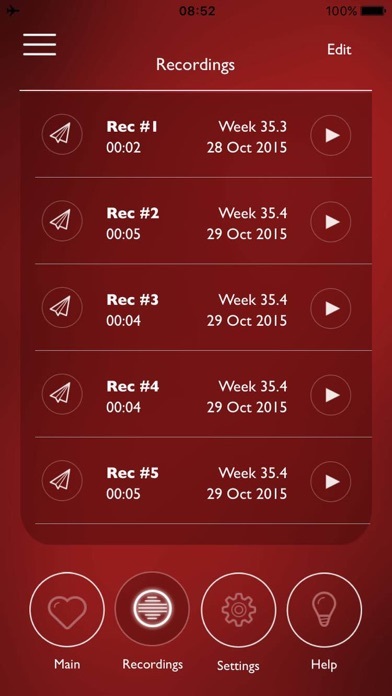 I used this app to record my 37 y/o brothers heartbeat as he continued to fight end stages of colon cancer. I will treasure this sound for the rest of my life. This app it’s not working for me and I’m 25 weeks pregnant. I’ve been trying to delete and unsubscribe from this app but I’m still getting charged. I contacted Apple and look into the website and i can’t find how unsubscribe. Could not tell what was the baby’s heart beat and what was white noise. There are a lot of people who have loved this app, unfortunately I was not a fan.